Washington, Nov 26 (IANS) Offering a new reward for up to $5 million for information all those responsible for the 26/11 Mumbai attacks in 2008, the US has issued a statement asking Pakistan "to implement sanctions against the terrorists responsible" for the atrocities that led to 166 deaths. US Secretary of State Mike Pompeo on Sunday expressing solidarity with the people of India and the city of Mumbai on the 10th anniversary of the attack, said: "We stand with the families and friends of the victims, whose loved ones were lost in this act of barbarism, including six American citizens. 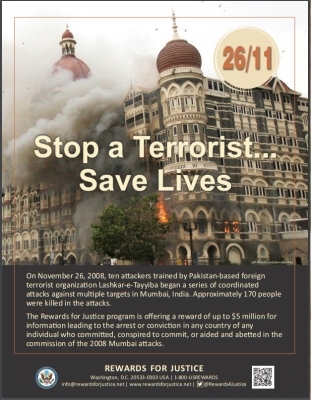 The barbarity of 26/11 shocked the entire world. "It is an affront to the families of the victims that, after ten years, those who planned the Mumbai attack have still not been convicted for their involvement." "We call upon all countries, particularly Pakistan, to uphold their UN Security Council obligations to implement sanctions against the terrorists responsible for this atrocity, including Lashkar-e-Tayyiba and its affiliates." The US is committed to seeing that those responsible for this attack face justice, the State Department said in a release.